These fresh roasted tomatoes make a great marinara sauce. 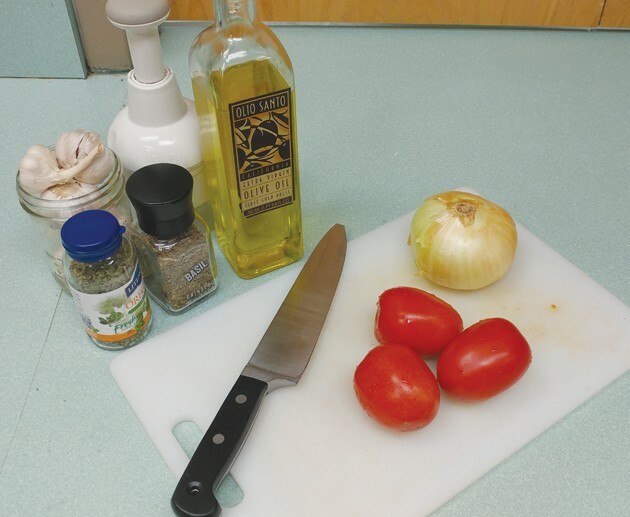 Ingredients for caprese salad are simple and flavorful. You can feel the slight change happening. It’s very gradual, but it’s there. The days have still been hot overall, and there is still a lot of fire danger, but bit by bit, the evenings have started to drop into some downright good sleeping conditions. This is a great time to leave the windows open for fresh air, as well as cool down your home and push down demand on the air conditioner to much later in the day. 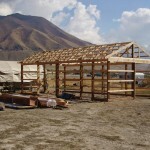 Readers of this paper know that an important Tooele Valley business had a tragedy happen when one of its poultry houses ignited. The fire spread to an adjacent laying house, resulting in the death of over 250,000 hens. The conveyor system that is used to move eggs throughout the complex was made inoperable, preventing timely refrigeration of eggs, and they had to be discarded. Several days after the fire, we drove over to the Fassio Egg Farms property to gain of a sense of what had happened. The fire had been on the south edge of the facility, close to Erda Road. Even though the destroyed buildings had already been razed, we could see that the size of the fire was significant. There was a track hoe at work, removing burned matter. Even though it was several days after the fire, every scoop would smoke as it was picked up and put into a metal waste container. When there is that volume of material burned, heat is retained for a long time. No wonder firefighters remained on site for so long to assure that hot spots are monitored and put down quickly. Fassio has been a part of this community for a long time. We live not far from one of their facilities. From time to time, when the breeze is just right, we get to experience rural living — what can best described as an intense experience. They were here when we moved in, and we knew what we were getting into. I’m sorry to see this happen to them, and I’m confident that they will take some insights from this incident and be better for it. They are committed to keeping their full team employed and coming back stronger than ever, so kudos to them. One of the things I like best about this time of year is that my efforts in the food plot start to pay off. The squash and pumpkins are coming along and coloring up beautifully. The butternut squash is prolific and I’m already thinking about the butternut squash soup on our table soon. The garlic had been harvested back in late spring and early summer, and it’s nearing time to replant it and get started for next year. There’s something optimistic about seeing that garlic standing proud right through the snow that will be coming. Those blades of green, contrasting with the wintry gray and white, is a sight to see. I planted a late batch of corn, just to see if we could get in a crop and enjoy a bit of summer as autumn comes on. It’s tasseling up now, so we’ll see. 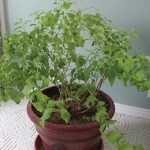 Of course, the zucchini and basil have been highly productive, with the former being made into sweet bread or casseroles, and the latter either enjoyed fresh in spring rolls or caprese salad or dehydrated for use in marinara sauce and soups later on. If you’d like to see how we dry basil in our oven, you can visit our YouTube channel and watch for yourself. Simply go to https://youtu.be/eO0m4eb86_o. 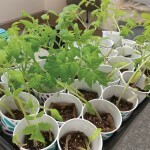 You may have had a slow start on your tomatoes this year. I know we did. The nighttime temperatures remained too high for quite a long time, hindering blossom set. No set, no fruit. Those that did get started were prone to stunted size, or blossom end rot. However, the wait has been worth it and there is a bumper crop coming our way. There are both slicing and paste tomatoes queuing up right now. At one time, an onslaught of tomatoes was difficult to handle, and a lot went to waste. No more. Over time, we’ve developed our “go-to” dishes and preserved goods to assure that the end of season bump of tomatoes get spread out over the winter. Here’s some of our favorite uses. First, when freshly harvested, there is nothing like slicing tomatoes into rounds, and layering them with soft mozzarella cheese, sprinkling on a bit of kosher salt, basil leaves, and some olive oil and balsamic vinegar. Caprese salad is a favorite dish in Italy and Italian ethnic areas, and once you taste it, you’ll know why. A BLT sandwich, with vibrant tomato taste, is another favorite. Of course, not using some of those great tomatoes for homemade salsa would be a major lapse. There are so many variations of salsa due to its popularity. Some types use roasted tomatoes and peppers, others fresh. There are differing levels of heat, depending on the peppers used. I like mine medium, with lots of onion and cilantro mixed in. Salsa can be used on so many dishes, and large batches consume a good quantity of tomatoes at a time. Another dish we’ve added in the last few years is marinara sauce. Our daughter, who is a chef, taught us the basics, and in three attempts, Maggie nailed what is now our standing “house” marinara. She demonstrated how she prepares this great sauce earlier in the year at the Master Gardener’s Spring Expo. Folks, this is seriously good eating. It has many uses in our culinary repertoire, including eggplant parmesan, over pasta or steamed spaghetti squash, lasagna, pizza, sloppy joes and as one of the ingredients of the meat and cheese mix we use in preparing zucchini boats. Marinara can be canned or frozen in portioned packets for convenience. 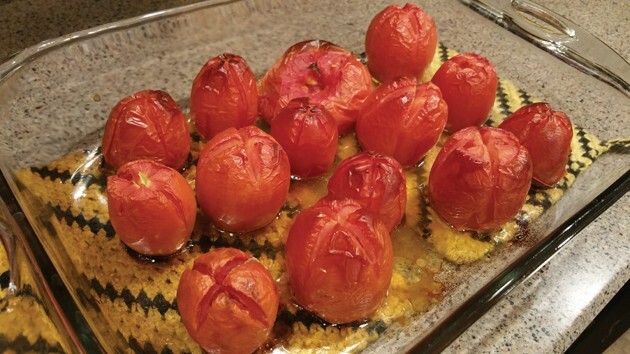 Making it is a sensory experience as it takes time over the course of a day to roast the tomatoes, get the sauce put together and simmering, and letting it reduce to the right consistency. I like it for its simplicity and use of so many things directly out of our garden; garlic, onion, tomatoes, basil and oregano. For those of you that watch our YouTube channel, we plan to produce a video in the next several weeks that will show you how we make marinara. This is too good to keep to ourselves, and we know that you’ll enjoy having this recipe. Fellow Master Gardener Mae Freestone shared her tomato soup recipe with us several years ago, and it too is a seasonal favorite, using late season tomatoes. You know what I mean when I say it’s hard to beat a hot bowl of tomato soup and a grilled cheese sandwich — talk about a comfort food. Of course, there’s fried green tomatoes as well. Frankly, we rarely prepare this dish, because there are so many preparations we enjoy ripe tomatoes in. One of the characteristics that I especially appreciate about tomatoes is that they ripen beautifully after they are picked. This is really helpful as the cold weather comes in and a freeze threatens. Simply harvest all the tomatoes, hard and green as they may be, and put them on cloths on a table. Assure they don’t touch, and watch the magic begin. We arrange them from least to most ripe, and use them as they are ready. If we have any left over from all the uses mentioned earlier, we stew and can them to use as a base of sauces and soups. When preparing tomatoes for use, all the trimmings are a special treat for our chickens. When the tomato scraps hit the coop floor, there’s a mighty competition among the flock to see who gets the most. In fact, no part of our tomato harvest now goes to waste. Even pieces and cut offs that may not be suitable for chicken treats go to the compost pile. There’s something gratifying about growing crops to enjoy and that are so efficient.